As if anyone didn't see this coming. Online multiplayer is a given in just about every RPG, whether it fits or not, but I think we are all in agreement that Dragon Age: Inquisition could benefit from being able to party up with friends. BioWare has confirmed that you'll be able jump online into a four player romp with friends once Dragon Age: Inquisition goes live in November. The online campaign will be an entirely different story, and it will change the focus from storytelling and choices to gathering loot and dungeon crawling with friends. The unfortunate news is that you won't be able to bring your customized character along with you as BioWare has 12 pre-generated characters ready at launch. Dragon Age: Inquisistion's multiplayer doesn't quite reach the expansive levels of the single player campaign, but BioWare described it as "an action-packed dungeon-crawling four-player co-op experience." "ollowing the success of Mass Effect 3's multiplayer mode, Dragon Age multiplayer includes fast-paced matches requiring strategic team gameplay while adding Inquisition's tactical class combat and extensive loot and crafting systems. A FAQ released by BioWare should answer all of your concerns. Unlike Mass Effect 3, this multiplayer won't be tied to the single player campaign in any way. We wanted to make sure that the two economies are separate, which will allow a stronger progression in both SP and MP. If you play Dragon Age multiplayer, you will learn how each class plays a different role in combat, how different skills work, and how your party composition can give you a tactical advantage on the battlefield. This knowledge is transferable to SP, but items are not. BioWare has also confirmed that despite the game having in-game purchases, everything will also be available through in game currency as well. 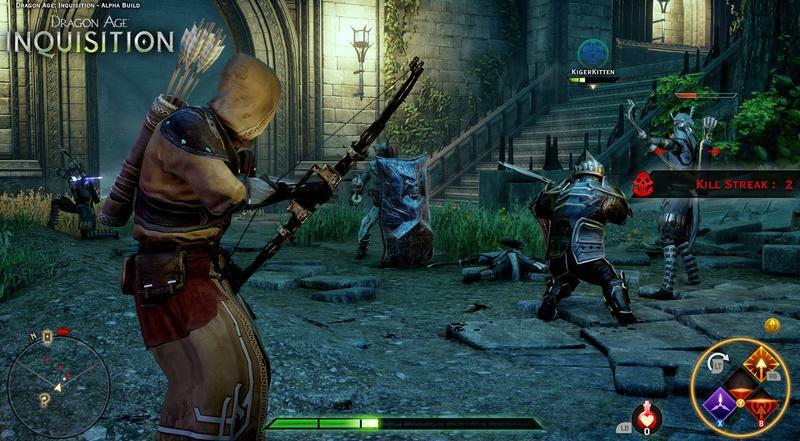 There will be no pay walls in Dragon Age multiplayer. Everything is accessible with gold coins. You can use premium currency, but you don't have to. Just as long as I don't have to pay to make a timer run down faster, I'll be just fine and dandy not coughing up any extra money for things I can work for. I'm excited for the multiplayer, even if it's far more basic than the actual single player game. BioWare's work with Mass Effect 3's multiplayer exceeded all expectations, and I'd be more than happy to experiment online with them again. Dragon Age: Inquisition will be released for the PlayStation 3, PlayStation 4, Xbox 360, Xbox one, and PC on Nov. 18.